(left to right) Spirit of Blue Foundation Executive Director Ryan T. Smith and Bill Janson, president of Eleven 10, LLC presented a ceremonial check for tourniquets and cases to Brenda Tiffany, mother of fallen Trooper Cameron Ponder, Kentucky State Police Commissioner Rick Sanders and Sgt. Josh Lawson, commander of the KSP Public Affairs Branch. 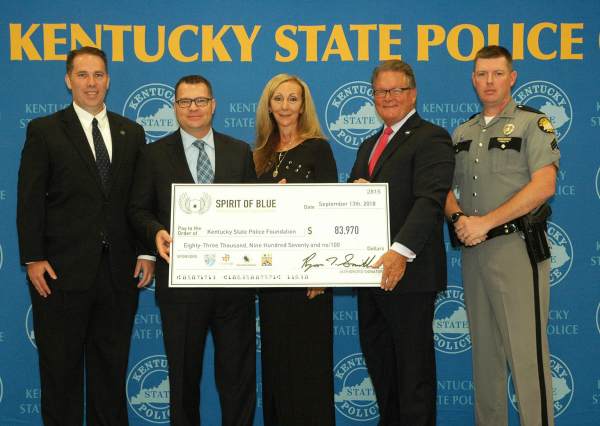 FRANKFORT, KENTUCKY – September 17, 2018 – The Spirit of Blue Foundation announced that it has awarded the Trooper Joseph Cameron Ponder Memorial Safety Grant to the Kentucky State Police Foundation (KSPF) to outfit all 1,000 troopers and officers of the Kentucky State Police with lifesaving tourniquets inside of rugged duty belt cases. The KSP uniform policy was amended to include mandatory wear of the North American Rescue Gen7 C-A-T Tourniquet inside of an Eleven 10 RIGID TQ Case with High Gloss finish and Shirt Shield attachment as part of its official uniform. Both companies worked with Spirit of Blue to configure the product specifically for KSP. The grant was funded in large part by a strategic partnership with Law Enforcement United, along with contributions from Eleven 10, North American Rescue and Sportsmen Organized for Law Enforcement, along with a number of smaller private donations, and is valued at $83,970. The grant is named after KSP Trooper Joseph Cameron Ponder, who was killed in the line of duty on Sept. 13, 2015. Trooper Ponder’s mother, Brenda Tiffany, was instrumental in the inception of this safety grant and was on hand at a special ceremony held at the Kentucky State Police Training Academy on September 13, 2018. Tourniquets are vital pieces of medical equipment that officers require on the road in the event of a traumatic injury to an extremity. When only precious minutes exist to treat such an injury, tourniquets are able to be applied individually or on a fellow officer to prevent excessive blood loss until that individual can be placed into medical care. As a secondary benefit, officers who carry a tourniquet are also able to use them to rescue a member of the community who may have experienced a similar type of injury. To date, Spirit of Blue has granted 2,196 tourniquets nationwide and five documented Community Saves have been made as a result. Law Enforcement United (LEU), the grant’s sponsor, is an organization of 1,000 active and retired police officers who honor fallen officers and raise funds to assist charitable organizations that serve the law enforcement community. Each year members of the organization ride 250 miles or more into Washington, DC to participate in National Police Week events and carry flags in honor of each fallen officer which are given to the surviving families upon their arrival. Since its founding in 2009, LEU has raised over $5,750,000 for law enforcement causes. Statistics released by the Officer Down Memorial Page show that 105 law enforcement officers have already lost their lives in 2018 – a 5% increase over the same period in the year previous. 40 of those deaths were firearm related, an 18% increase over the same period in 2017. The reality of these statistics, and the increasing number of underfunded law enforcement agencies across the country, fuel the Spirit of Blue safety grant initiative. The Spirit of Blue Foundation actively encourages the public at large to honor and appreciate law enforcement officers who serve and protect our communities. By supporting the Spirit of Blue Foundation, the public can make an impact in the lives of law enforcement officers every day. To learn more about the Spirit of Blue, or make a donation, visit www.spiritofblue.org.